The race to replace Gordon Brown is warming up, with rumours Ed Balls may throw in the towel. "This is Labour at its best, out of office, and squabbling like cats in a sack," writes political analyst Peter McHugh for Channel 4 News. It was the rare appearance of the not-very-often-spotted glowering Gordon at the weekend which reminded the nation we were not just short of a few bob but a leader of the Labour Party. Gordon Brown, aware of his popularity in certain circles, chose that well known suburb of Kirkcudbright, Uganda, to re-emerge on the public scene. Meanwhile back in London the not very famous five contenders for his job were out and about. The contest has been going for weeks and several hundred people have been fascinated. This is Labour at its best, out of office, and squabbling like cats in a sack. I’m told that Ed Balls' departure from the leadership race is still "possible though not imminent". He has a couple of weeks before ballot papers are printed. He has 33 MPs' nominations. If Ed Balls recommended they shift to David Miliband that could have quite an impact. In total they represent 12 per cent of the MPs’ section of the electoral college which makes 4 per cent of the entire electoral college. There's no guarantee that all of them would follow any possible Ed Balls recommendation to switch to Brother David but quite a chunk of them could. That would give David Miliband a big bit of momentum – as would a recommendation by Jon Cruddas. Unlike the Oxbridge duo of Nick and Dave presently running the country on behalf of those trained to lead, Labour has spread its net wide and only five out of the five candidates to take Gordon's mantle went to Oxford or Cambridge. Way out in the lead, according to those noted Labour Party financiers Ladbrokes, are the Miliband brothers who have been nominated by just about anyone who can spell their names. Bottom of the pile is Ed Balls who according to the list of nominations has even fewer friends than Diane Abbott, something she is bound to demand a recount on. And then there is Andy Burnham, whose main claim to fame is that he has eyelashes Penelope Cruz would die for. So that's the stable from which "millions of party members" will choose the next leader according to party propaganda. In fact excitement has been so high that MPs have started their summer holidays. Clearly embarrassed by the reports of their sumptuous lifestyles during the last parliament the new lot agreed to take only 66 days off between now and October. So it's against this backdrop that Labour sets out to decide who will follow in the footsteps of the fun boy two Tony and Gordon, or the fun boy three if you add Peter Mandelson trying to flog his book. Let's look at the contenders. Favourite David Miliband says he should have the job because he is ready to tell the party home truths about why they lost the election. David we remember was the one who chose the Grand Old Duke of York as his role model during those dreadful days when Gordon's fingers were being prised from the despatch box. He also thinks he should get the job because he is older than his brother Ed and so if he doesn’t he will tell their mam. David also says, or rather whispers, that he is the real heir to Blair, not the other Dave the Tory, and given the chance he will lead them quickly back to the corridors and chauffeur driven cars of power. Having nailed off the centre right ground David M has left the centre left ground to brother Ed, neat footwork says the cynics. Ed Miliband has successfully managed to hide the fact that for years he was one of Capo Gordon's bag carriers unlike Ed Balls who wasn’t quick enough to distance himself from the clunking fist. 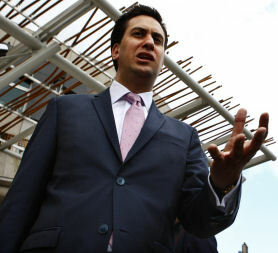 Ed’s appeal to his side of the Labour electorate is that his is not his brother and he's not the other Ed. Which leaves the other Ed cornered being himself. The game for him was finally up last Saturday when Britain's biggest union Unite decided to back Miliband E despite the fact that its political director is that other well known Gordon hit man Charlie Whelan. "The question in the end is that Unite decided was that Ed Miliband was the best person to beat David Miliband" said Ed Balls. Having succinctly spelled out the truth he then promised to continue his campaign. Making a play for the future, which in Labour terms could be this time next week, is the heartthrob, Andy Burnham. Andy isn’t in it to win it this time but if the voting age drops to 16 soon don't rule him out. And then there is Diane Abbott. A recent opinion poll said she was the second favourite among voters, sadly for her apart from members of the Labour Party. Diane has been in permanent opposition since being elected backing the 1980’s. Like Tony Benn she is always at her best when Labour is out of power. Snubbed by Tony and Gordon, Diane endeared herself to the left wing of the party by denouncing those Labour leaders who send their kids to private school. She then sent her only son to the £10,000 a year City of London School. "I knew what could happen if my son went to the wrong school and got in with the wrong crowd", said the MP for Hackney North and Stoke Newington, a sentiment no doubt shared by her constituents. Diane knows she has no chance of winning but is betting on a reward from the eventually victor of a seat in the shadow cabinet. The position of shadow secretary of state for self importance has been mentioned although there are many other candidates for this post. And so it comes down to the wire and which Miliband is best. Aficionados of the political scene will be spending much of August in the natural habitat of the Milibands. Primrose Hill is a leafy suburb of north London inhabited by those who wish they could afford to live on other hills like Notting, home of Dave Cameron, or even Beverly, home of even richer people. It will be here, if you haven't got a life, that you can observe the final act on the way to the end of the play. Diane Abbott (see her Who Knows Who map) played Lady Macduff to Michael Portillo's Macduff in the school version of Macbeth. I think we have all said enough. Peter McHugh is the former director of programmes at GMTV and was this year awarded the Royal Television Society Lifetime Achievement Award. Labour leadership: who are the candidates?